The Goods and Services Tax (GST) tax was introduced on 1st of July, 2017. 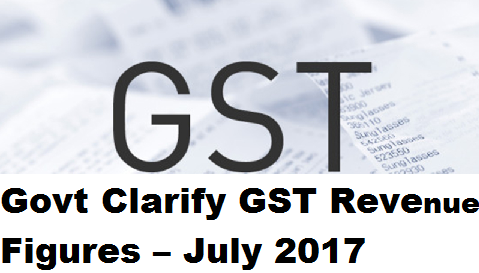 The last date for payment of GST for the month of July 2017 was 25th August, 2017. The last date for filing returns in cases, where the taxpayer wanted to avail transitional credit was 28th August, 2017 and, in all other cases, it was 25th August, 2017. If we exclude the taxpayers who have registered with the GSTN in August 2017 and the composition dealers, total number of tax payers who were required to file the returns for July 2017 is 59.57 lakhs, of which, as on 29th August, 2017 (10 a.m.), 38.38 lakh returns have been filed, which is 64.42% of the total number of returns, which are to be filed for the month of July 2017. The total revenue of GST paid under different heads upto 29th August, 2017 (10 a.m) is Rs.92,283 crore. The total CGST revenue is Rs.14,894 crore, SGST revenue is Rs.22,722 crore, IGST revenue is Rs.47,469 crore (of which IGST from imports is Rs.20,964 crore) and Cess is Rs.7,198 crore (of which Rs.599 crore is Compensation Cess from imports). It may be mentioned that IGST will be allocated between the CGST and the SGST to the extent that the same is used for payment of CGST/SGST. This exercise will be done based on the cross-utilisation report to be received from the GSTN. Exact revenue figures of the Central and the State Governments respectively will be known after this exercise is complete before the end of this month. Out of total 72.33 lakh taxpayers, 58.53 lakh taxpayers have completely migrated to the GSTN and 13.80 lakh taxpayers are yet to complete their procedural formalities to migrate to the GSTN. The number of new taxpayers who have registered with the GSTN upto 29th August, 2017 (10 a.m.) is 18.83 lakhs.